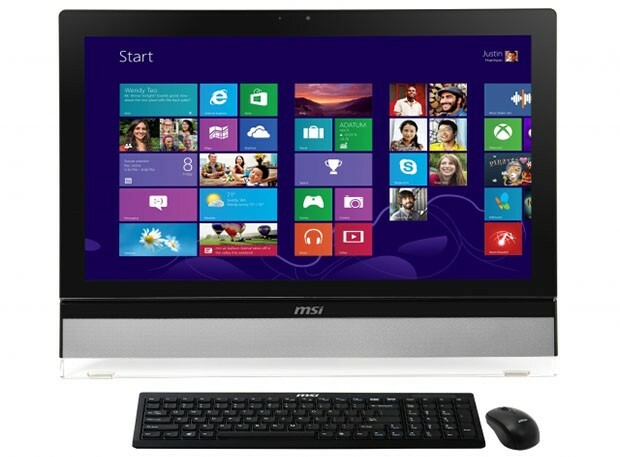 MSI has expanded its range of computer equipment through the issuance of monoblock All-in-One PC MSI Wind Top AE2712 with the operating system Windows 8. Introduced new product MSI Wind Top AE2712 is based on the chipset Intel H61 and includes a processor Intel Core i3-3220 with a frequency of 3.3 GHz (3 MB cache, integrated graphics Intel HD Graphics 2500). The device is equipped with a 27-inch display with Full HD resolution of 1920×1080 pixels and LED backlight. As an option, can be used a touchscreen can recognize up to 10 simultaneous touches. Monoblock All-in-One PC MSI Wind Top AE2712 also has on-board 4 GB of memory standard DDR3, 3.5-inch hard drive with a spindle speed of 7200 rev / min 1TB, optical drive DVD. Also, available in both Gigabit Ethernet port Ethernet, wireless module Wi-Fi 802.11 b / g / n, 2-megapixel webcam, card reader 3-in-1, two speakers. Of the interfaces available two ports USB 3.0, four-port USB 2.0, input and output HDMI, audio jacks for headphones and a microphone. As an option, the unit can be equipped with a TV tuner and a discrete graphics card NVIDIA GeForce GT630M with 2GB of DDR3 memory with support for Optimus. The package additionally includes a wireless keyboard and mouse. It is expected that the new one-piece PC MSI Wind Top AE2712 will go on sale this month, moreover its price on the website Amazon UK is set at £ 830.